Gazebos have many different uses including a getaway, in the garden, to remember someone, an office, a pool cabana, storage and much more! We’ve seen them used at a home, park, school, business or townships. 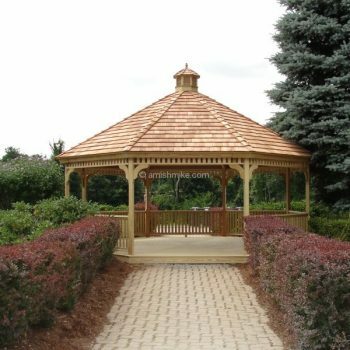 Our line of wood gazebos features many different models and designs, including octagon, oval, standard oval and rectangle. We offer these gazebo models with a pagoda roof, steeper roof pitches, bracket designs and spindle packages. 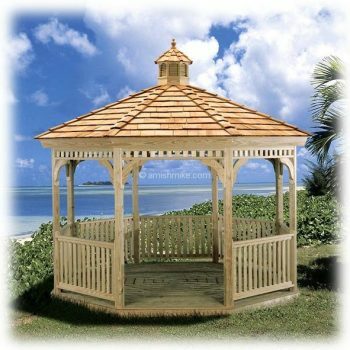 Our wood gazebos are made of pressure treated wood and cedar shake shingles. The cedar gazebos are made of cedar with a cedar shake roof. The cedar shake roof utilizes a wood lathe strip underlay. We offer an architectural shingle, using a tongue and groove board underlay system, at no additional charge. 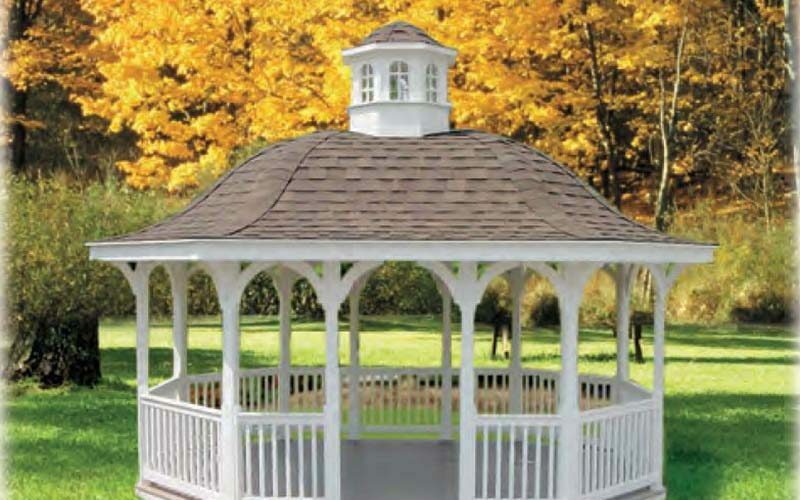 Amish Mike’s gazebos also come in a natural sealer and/or all Cabot stain colors and finishes at an additional cost. If turning your gazebo into an outdoor office or just a getaway, we can install a pre-electric package so you can install a light, fan or even just have an outlet nearby for any use. Most of our gazebos are delivered in one piece with its own wood floor. We can also build them on site with or without a floor. We also offer in this series, a “New” screen house. The main difference in a “New” screen house is that the bottom rail is a tongue and groove panel with a screen frame on top of it or you can have a slider window installed, making your gazebo an all season room. On all our gazebos, the screens are removable. 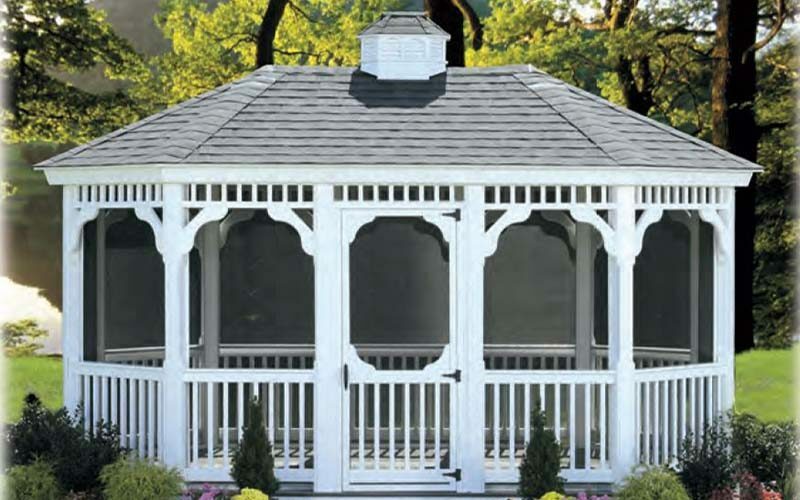 While the octagon gazebo is the most popular design we feature it in 12 different models and a wide range of sizes. The rectangle and oval gazebo are available in 4 different models and a wide range of sizes. The standard oval is available in 2 models and a few sizes. 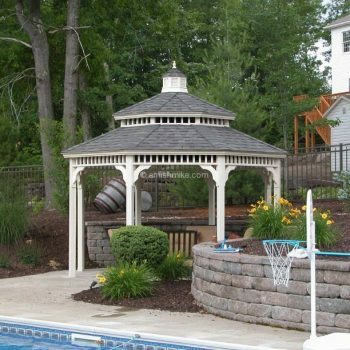 All our gazebos do include a cupola with the exception on the signature. Many other options are available.